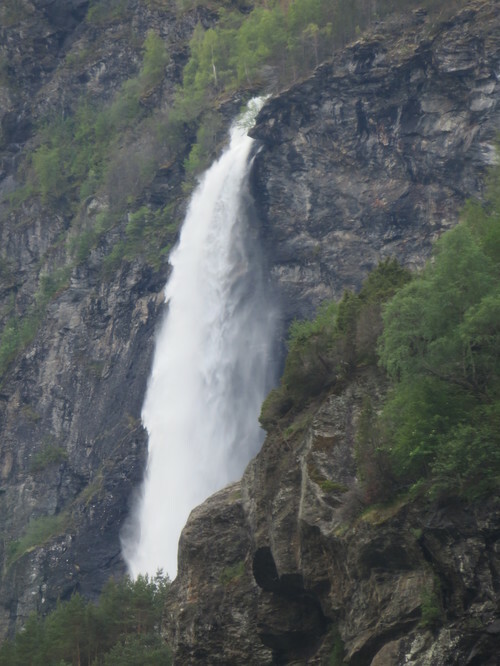 We headed up the coast of Norway after leaving Stavanger, 244 nautical miles to Flåm. 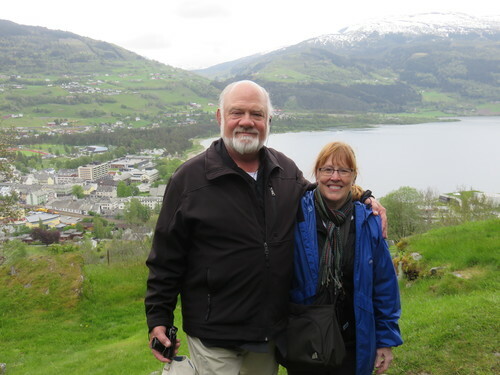 That means we were headed down the Sognefjord, the largest fjord in Norway. 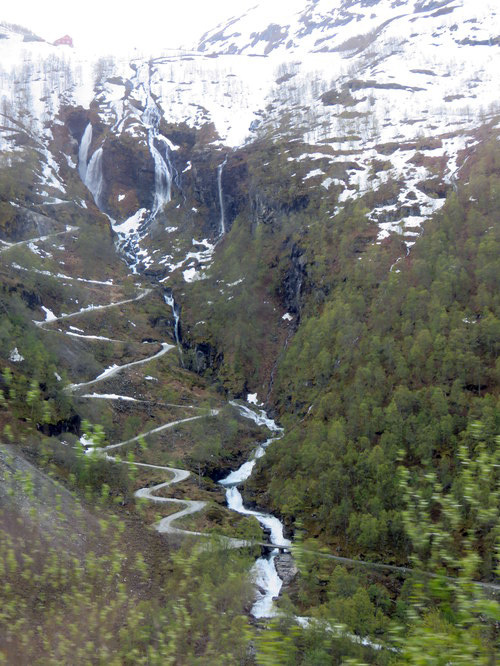 Then down the Aurlandsfjord to Flåm. 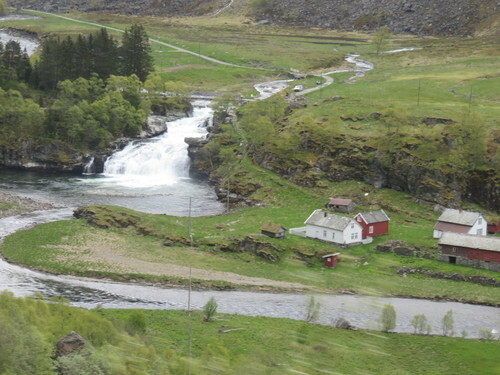 We left Stavanger at 6 PM, so by the time we headed into the fjord, I was already in bed. I awoke at 5AM and took a peak out the window. 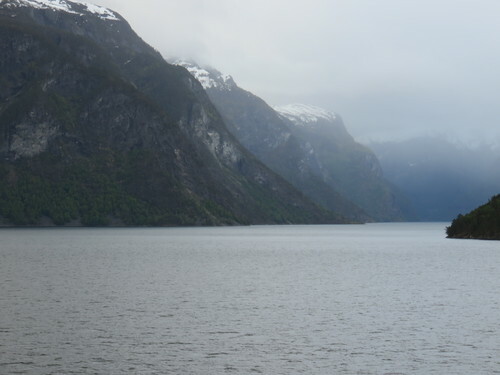 Since it literally never gets dark in Norway during the summer, I had no trouble seeing that we were in the middle of a beautiful fjord. 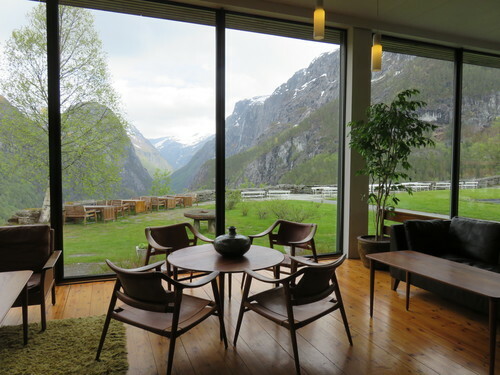 I quietly dressed and headed up to the Explorer’s Lounge where there were already a number of passengers gathered for the scenery. At 7AM, I decided Mike could no longer sleep and needed to see the beauty around us. What I didn’t think about was the fact that we would be leaving by the same route. 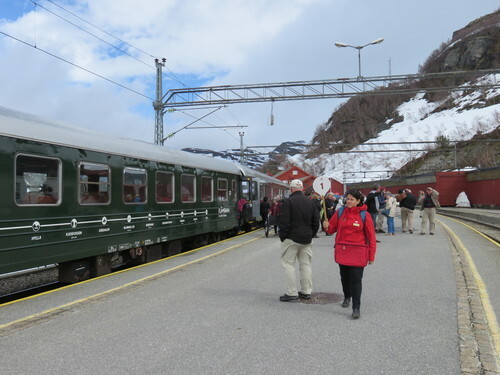 The excursion we chose for the day was a full day trip by rail and bus. 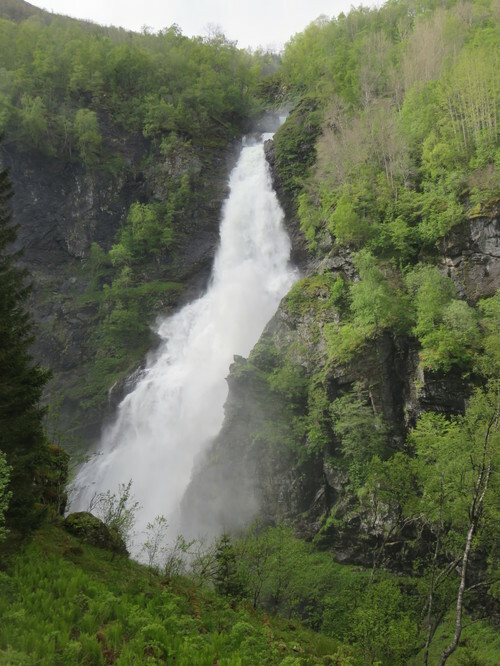 We started out on the Flåm Railway, climbed nearly 3,000 feet and passed through 20 tunnels. 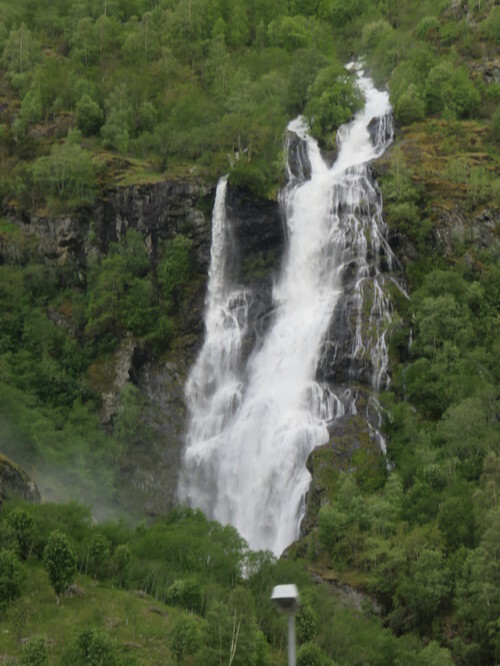 The train stops at the Kjosfossen Waterfall so visitors can see the Huldra, a seductive forest creature, that dances and sings in front of the waterfall. 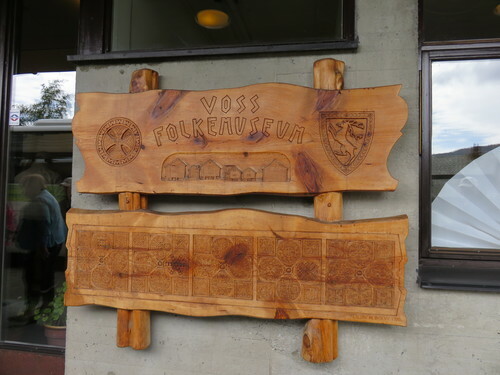 A change of trains and we ended in Voss. 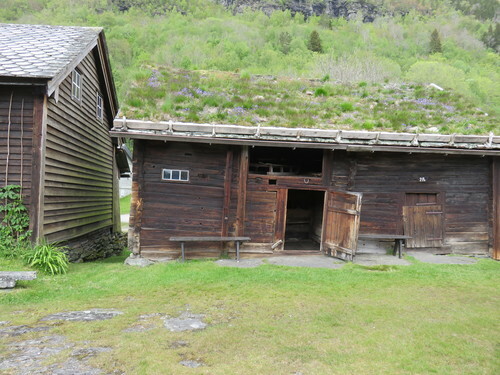 We stopped at Molstertunet, an open air museum. The most amazing thing about the farm buildings that were built between 1600-1870, is that they were occupied until 1927!And what a view! 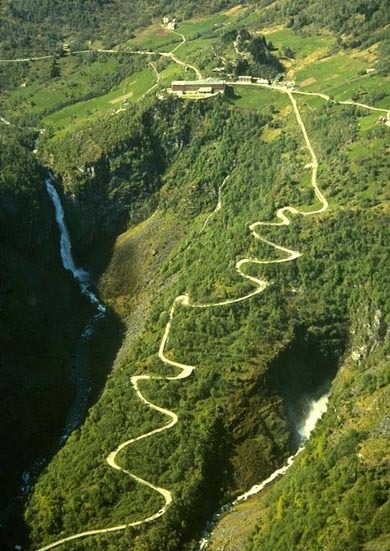 After a stop for lunch at the Stalheim Hotel, we headed back to Flåm via Stalheimskleiva, a steep road full of hairpin turns. 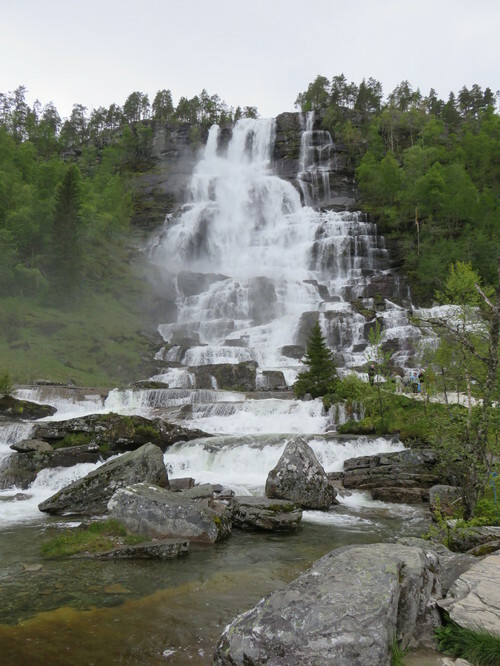 I have never seen so many waterfalls. They were everywhere. There was still snow on the peaks, so that probably added a few that will not be there in the summer. But still, so many! Bye, bye Budapest. Hello river cruise.